The only swim cap that doesn’t intend to clench your head! Got long hair, braids or dreadlocks? It takes time and effort to look after it. Swim classes, pool therapy, or just swimming scare you? You know what a pain it is to dry your hair afterward, when it’s partially or totally wet, then comb your hair, style your hair, and so on. Every single ordinary swim cap (without exception) is designed to press against your head. Check out any high-brand swim cap. Just look at it and imagine how it would work when placed on your head. The more hair you have – the harder the pressure on your head. 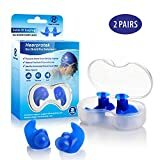 Even those “large swim caps for long hair” – they are the same, just larger. That means they still would press on your head from every side. Enlarging the entire cap further would lead to it not keeping out the water. With that type of swim cap, you always have to choose the lesser evil – either too much pressure or all the water inside. What is the solution we offer you? Imagine a swim cap that doesn’t push, press, or clench your head. This LOOSEFIT DESIGN is based on an unparalleled principle – we divide the functions. One part of the cap FITS your head, while the other part leaves your hair LOOSE. It doesn’t touch your head – so it doesn’t press against it. Imagine a headband and the way you put it on. That’s the feeling you’ll have with our Swim Cap. 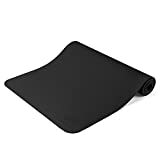 It’s made from the toughest silicone material on the market, which is stretchable, durable, soft, and comfortable (unlike Lycra), and it will last for a long period of time. 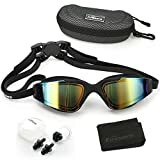 Suitable for people who want to enjoy and have fun swimming without getting their hair wet, especially for those with dreadlocks, curly, and long rebonded hair. A wonderful gift for yourself, your friend, or your family who is fond of going swimming, indoors or out. We offer you a 90-DAY MONEY BACK GUARANTEE. Click “Add to Cart” to start enjoying swimming NOW! LARGE SPACE for your HAIR to fit COMFORTABLY. The size is EXTRA LARGE – fits very long and curly braids, locks, dreadlocks, etc. Some colors come in a smaller DOWNSIZED version as well – for long-haired kids, girls, teens and for men & women with moderately long hair. LOOSE-FIT DESIGN – unique lab creation. NO TIGHTER THAN A HEADBAND. Imagine, NO PRESSING your hair bun or ponytail TO YOUR HEAD, no sliding off, NO MORE HEADACHES. Easily slides onto your head Lahtak swimming cap, holding GENTLY. DRY HAIR IS THE GOAL. 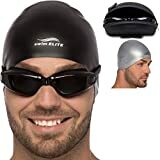 Although no swim cap KEEPS HAIR DRY 100% of the time, proper use of Lahtak™ Swim Caps for long hair can help you achieve this MOST OF THE TIME. You can ADJUST the TIGHTNESS by squeezing air out of the cap and getting a perfect seal. EXTRA DURABILITY and SUSTAINABILITY lead to an EXTENDED WARRANTY. 100% allergy free waterproof silicone used for Lahtak Swim Hat is the THICKEST POSSIBLE and simply CAN’T BE torn or BROKEN. We stand behind our quality and offer you a 90-DAY MONEY BACK GUARANTEE. If you don’t like your Swim Cap, we’ll refund your money upon your request. STYLISH, ELEGANT & FASHIONABLE LOOK. 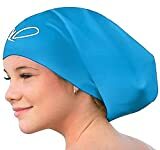 Lahtak Swim Cap for women with long hair is an additional fashion accessory. You can have your LONG HAIR PROTECTED in a fresh, novel and ATTRACTIVE WAY. With our LUXURIOUS COLORS, you will always be visible either in the swimming pool or in the open water.